in looking for images of som’s banco de bogota, i ran into this nice set of images of early skyscrapers in bogota, colombia, both finished and during construction (apparently the original source is not working). 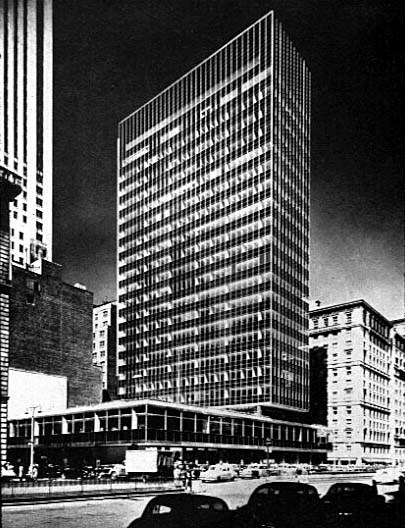 so what i originally meant to post was this comparison between som’s lever house (1952) and one of its lesser-known siblings, the banco de bogota (1958-1963), the product of a collaboration between som, lanzetta pinzon, and martinez cardenas (curiously, the banco de bogota has a slightly more recent building also by som according to wikipedia). more interesting than the similarities between these buildings are their differences: note the taller base in bogota, and the covered ‘soportal’ or covered walkway configuration typical of south american cities (a distant relative of the parisian arcades). through small differences, these buildings show us attention was paid to their specific urban sites. in bogota, som gives the base a taller ground floor and adds three floors on top, in a street that at the time did not have many tall buildings. hence the base tries to relate to its surroundings before turning into the tower. however, it still seems to be too tall to work efficiently as a soportal, that is, as a cover from sun and rain: compare with the soportal of the neighboring building. in contrast, lever’s base is lower both in total height and in sidewalk-coverage height, but the atrium inside loosens the edge of the sidewalk, so that the lower ceiling is overextended horizontally. despite their problems, both buildings show that som was trying to address the problem of the urban nature of towers, rather than isolating them in the middle of deserted space… something some might argue mies did across the street. but as we know the seagram works precisely as an exception, not as a rule, since the plaza gets its well-defined edges thanks to its neighbors. note also that while the lever tower is perpendicular to park ave., creating slivers of space in the tight nyc landscape, the banco de bogota tower is parallel to the main avenue, playing up the reverse condition of emptiness. so actually both buildings are trying to address their different site conditions, despite their superficial similarities. those pointy floor plates look pretty nice, but you can see how they are being covered up in the lower floors… doesn’t look very promising. in contrast, the naked floor plates remind me of mies’s famous skyscraper project (the pointy one, not the curvy one, just to be formally consistent).the core configuration is promising but seems ruined by the excessive paneling. finished images and plans can be found here, further linking it to the mies project. note, however, the ground floor plan, where the ‘figure’ pointy plan intersects to the back of the lot with a reverse ground condition that fills in to the edges of the lot. this is perhaps what marina waisman referred to when she said we have no need for colin rowe’s collage city in south america, as we already have an existing collage condition. in this case, both figure and ground. additionally, the interesting thing about 60s and 70s skyscrapers in south america is that they were built in very dense downtowns, and were forced to deal with smaller, but very regular grids. the 60s were also the decade concrete hit south america along with oil money, thus changing the landscape of downtowns across the continent. more on that later, maybe.